A procedure couldn’t be found in library Addons\SItoA\Application\bin\nt-x86-64\sitoa.dll. The library will not be loaded. 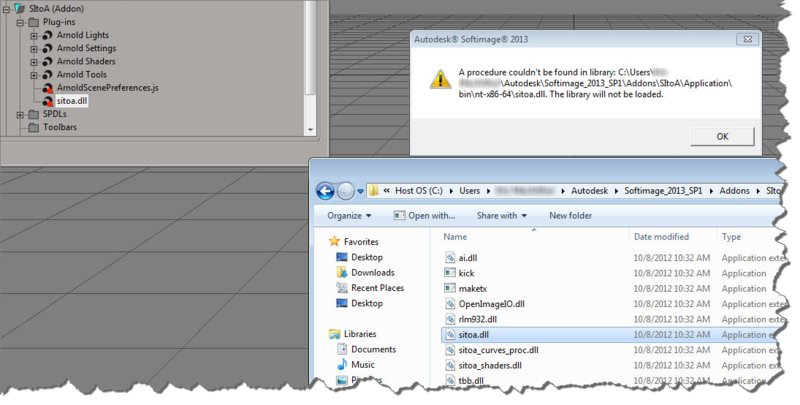 it usually doesn’t mean that Softimage couldn’t find the DLL (sitoa.dll in this case). Typically, this error is caused by a missing DLL dependency, or the wrong version of a dependent DLL. You can use Dependency Walker and Process Monitor to track down what’s going wrong. A “DLL dependency” or “dependent DLL” is another file that sitoa.dll depends on. When Softimage loads sitoa.dll, that other DLL isn’t found, or if it is, it’s the wrong version. And so you get the error. This entry was posted in Arnold, Troubleshooting and tagged Arnold, Softimage by xsisupport. Bookmark the permalink. In the actual case, the problem was another version of a DLL that Arnold uses. I never got the details, but I would guess it was a conflicting version of either OpenImageIO.dll or tbb.dll. That’s a good idea and I did it. I was thinking of unsticking the Installing post the other day.